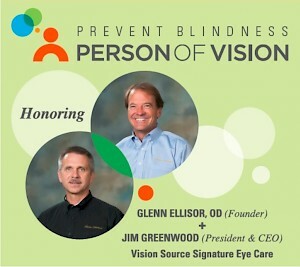 Prevent Blindness has chosen Vision Source Executive Chairman & Founder Glenn Ellisor, OD, and President & CEO Jim Greenwood, as the recipients of the 2019 Prevent Blindness Person of Vision Award. The award was presented on March 21, 2019, during the Prevent Blindness Person of Vision dinner at the Edison Ballroom in New York City, in conjunction with Vision Expo East. All event proceeds will support the Prevent Blindness sight-saving programs.